My recent trip down under with the other nine winners from the 2011 OMY blog awards, was sponsored by Tourism Victoria along with the airline partner, Jetstar. Of course, I wanted to take the opportunity to put forward my experience as a first time traveler with this airline, but also I need to tell you of a very strange occurrence that proves just how small this world is. So let me do this in reverse order. On my flight back home to Singapore, I was extremely weary and foot-sore from my very late (but quite profitable) night at Crown Casino. After crawling into my comfy bed at the Citigate hotel, I only managed a couple of hours sleep before the wake-up call came in to let me know that I should be getting ready to check out and prepare for the transfer to the airport. Given my experience on the way over, I had no doubt that I would be able to kick-back and relax in relative style and comfort on the Jetstar flight. Although I don’t often sleep on planes, and usually seize the opportunity to watch back-to-back movies, the sandman was in this instance waiting for me to sit down and put my head back - I think my eyes closed and I entered slumberland within minutes… but as I sat there, I dreamed that I heard the in-flight crew announce that today we would be flying with ‘Captain Bruce Rattle’… wait a minute… why would I dream of an airline captain from Jetstar with the same distinctive name as a young kid I went to primary school with in Caloundra (Sunshine Coast of Qld) some three decades earlier? I recalled a discussion I had some years earlier, just prior to relocating to Singapore (I had passed destinies with Andrew Rattle – younger brother of the airline captain of the same namesake), who told me back then, that Bruce was now a pilot and was also living in Singapore. I knew this must be more than just a coincidence… my eyes were immediately open and all my senses were on full alert – could it be possible that the young lad who was one of my best mates when we were not yet even 10-years old, the same young kid who I remember could run like the wind in the 100-metre sprint, was now flying the Jetstar plane on which I was returning home? I asked the very friendly staff if it would be possible to get a message to Capt Rattle, to let him know that one Peter Breitkreutz was a passenger on board his flight. Of course, the cabin crew obliged and told me that I could send him a note once the flight had taken off. The sandman then won the battle again. An hour or two later I awoke, and immediately that same young flight attendant approached me and told me that the flight captain had earlier visited my seat and upon seeing me asleep decided it would be more respectful to allow me to finish catching the Z’s. The attendant was under strict instructions that as soon as I was awake, he was to invite me to the front of the plane to speak with the captain… which I did. Wow! What a small world – Bruce came out of the cockpit to chat, and immediately upon seeing him, I could remember the little boy who was my friend. Of course, we are both much older now, but we both shared the same sentiment – before we set eyes on one another, we were both unsure if there would be any recognition… But although time ages us, puts lines on our faces and distorts our appearance somewhat, the recognition was immediate. Here were two boys of 7-years of age in the bodies of 40-something adults. We reminisced for quite a while, spoke of each other’s families and friends and low and behold, I discovered that another of my best mates from primary school was also living in Singapore, and that Bruce and Jon are both still great friends. We exchanged phone numbers and I pointed out my wife and boys to Bruce after the flight while we were waiting at the baggage claim. So my thanks to Jetstar – not just for such a wonderful experience on their airline, but also for connecting old friends. This was indeed a most magical moment... Jetstar could not have planned it any better! Now let me take you through my flight experience (at the airport and onboard) – like I said, I had not before travelled with Jetstar, but as a relatively frequent flyer, I obviously had certain expectations… and let me tell you, the raised bar was met and then some! Upon receiving my itinerary via email, some 48-hours out from the flight departure I went online to check-in – it’s important to me that I always get an aisle seat (I hate to be one of those people who need to climb over others as they lay reclined and asleep), so I always do online check-in when possible. The process for checking in, selecting a seat and printing boarding passes was extremely simple with Jetstar. Rocking up at the airport on the evening of the departure from Singapore, the web check-in queue was virtually empty – so 5 minutes later, my suitcase was on its way to the plane and I was all set for some duty free shopping while waiting for boarding. So far, 10 out of 10 for convenience, ease of website use and check-in speed. Wei Ding from OMY rounded all the bloggers up – he seemed to need to do that a lot while we were away – before we went through immigration. After which, we went our separate ways in small groups for shopping and eating at the Changi airport terminal. Arriving at the boarding gate on time, we were almost immediately walking up the gangway and heading for our seats. The take-off was smooth and uneventful, and the wonderful cabin crew provided a very high level of customer service and quality right from the get-go. The real ‘kicker’ was this – shortly after take-off (on the flight over and back), I was provided with a ‘Comfort Pack’ – a personal blanket and toiletries satchel. Then not long after, the attendant also brought me an inflight video unit. My choice of on-demand videos and TV… for a long(ish)-hall flight like this, I could not survive without a wide selection of movies to watch! The meals I was given were brilliant – dinner and then breakfast on the red-eye flight to Melbourne, and then breakfast and lunch on the way back to Singapore… I also opted for some snacks (and a couple of alcoholic beverages), which were priced very reasonably indeed. In all – a great first experience with Jetstar – if their intention was to impress me enough to recommend to others… it worked!! That’s why you are reading about it right now on my blog! 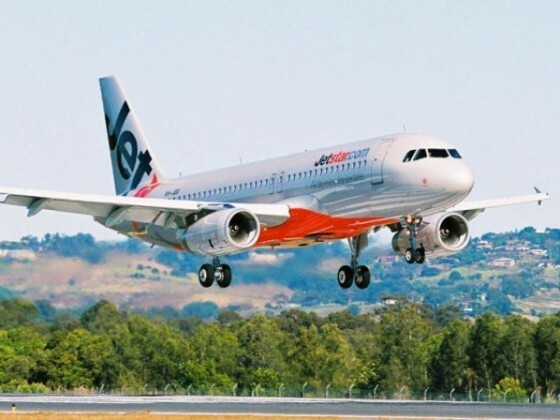 JETSTAR – An airline providing convenience and comfort, professional service – all at choice prices!! And… CONNECTING OLD SCHOOLFRIENDS! !